The distinctive sweetness from the caramelized onions makes this a special treat for family or company. Position two oven racks about 5 inches apart in the lower third of the oven. Preheat the oven to 425ºF. Lightly coat two large baking sheets or 12-inch pizza pans with cooking spray. Put the chicken into a zip-seal plastic bag. Add the marinade. Seal the bag and massage gently to evenly distribute the marinade. Place the bag in a bowl. Refrigerate while cooking the onions. Heat 2 tablespoons of the oil in a large skillet over medium heat. Add the onions; cook, stirring occasionally, for about 20 minutes or until lightly browned. Stir in the brown sugar. Cook for about 5 more minutes, stirring occasionally, until caramel-colored. Transfer the onions to a plate and set aside. Drain the marinade from the chicken. Discard the bag and the remaining marinade. Heat the remaining 1 tablespoon oil in the same skillet over medium-high heat. Add the chicken; cook, stirring occasionally, for 8 to 10 minutes or until the chicken is lightly browned, fork-tender, and no longer pink. Remove the pan from the heat. Place the pizza crusts on the prepared pans. Evenly spread half the pizza sauce over each crust. 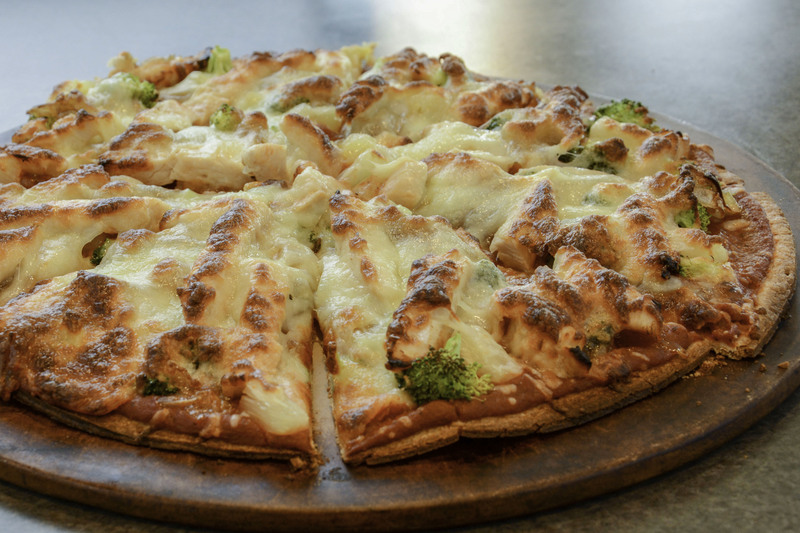 Top with half the broccoli, pineapple, onions, chicken, and cheese. Bake for 15 to 20 minutes, rotating the pizzas between the oven racks half way through baking, until the cheese is melted and the pizza is heated through. Sweet onions are thin-skinned and contain more water than regular onions, so they do not keep as long. The recipe makes two large pizzas—perfect for a crowd—but it can easily be divided in half.